San Pellegrino. We love watching “Top Chef” on television: The creativity and skill (not to mention energy level) of the “cheftestants” is inspiring. “Top Chef” draws its contestants from the kitchens of fine restaurants nationwide. But where do you turn for recognition if you’re not yet a chef, sous chef or even a line cook? There are culinary school competitions, of course, and at least one of them—the San Pellegrino Almost Famous Chef Competition—has a spectacular prize: $20,000 (nice) plus a year of paid internship at the restaurant of one of the finals judges (a great career opportunity). Contestants prepare a signature dish and are judged on technical skill as well as creativity and presentation. While there’s only one top prize, every contestant is a winner, gaining exposure to prominent local chefs and members of the media who judge and mentor them along the way. As everyone knows, in life it’s not only about the talent, it’s about the connections. Everyone who enters gets to make good contacts. Since it was established in 2002, the program has helped to launch hundreds of culinary careers. Last week we were invited to attend the Northeast regional competition, which crowned a regional winner and a People’s Choice winner. The 10 regional winners go to the finals in Napa Valley, held March 8-10 at The Culinary Institute of America at Greystone. Judges for this year’s finals include executive chefs Massimo Bottura of Osteria Francescana in Modena, Italy, Jean Joho of Everest in Chicago, Susur Lee of Lee Restaurant in Toronto, Tony Mantuano of Spiaggia in Chicago, Mark McEwan of One in Toronto, Rick Moonen of RM Seafood in Las Vegas and Michel Richard of Citronelle in Washington, D.C. The national winners from 2011 and 2012 both hailed from Kendall College in Chicago, and are now working at two of Chicago’s finest restaurants: Blackbird and Everest. The 2010 regional winner is now teaching at Kendall College. However, the Kendall winning streak was interrupted this year: While a Kendall College student won the regional People’s Choice Award, the regional winner headed to Napa Valley hails from from Sullivan University in Louisville, Kentucky. 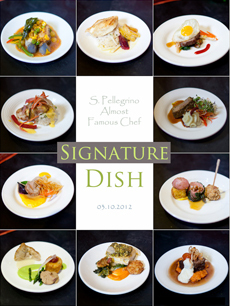 See the beautiful food and the winners on the Almost Famous Chef Competition Facebook page.